Honda has announced they will be launching an all-new 2014 Fit Hybrid that will get incredible fuel mileage. They claim the new fuel-sipping Japanese model Fit hybrid will achieve fuel economy of 36.4 km/L which translates to 85.6 mpg here in the U.S. This is the highest mileage among any hybrid model in Japan. The new Fit hybrid is scheduled to be in showrooms in Japan as early as September 2013. But will we see the new hybrid Fit in the U.S.? It’s not likely we will see the new fuel-sipping 2014 Fit hybrid here. And even though the new hybrid gets 36.4 km/L (85.6 mpg) in the Japanese JCO8 cycle, this test always produces higher results than the U.S. test cycle. But this is still excellent fuel-efficiency numbers from the new Japanese Fit hybrid. But Honda says this will be a Japanese model only. 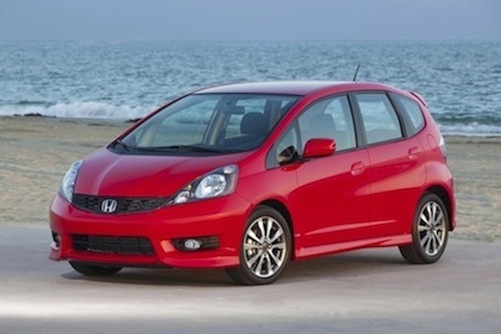 The Honda Fit is sold in the U.S. with a 1.5-liter four cylinder and gets 35 mpg with the automatic transmission. And it’s also sold as a 100 percent electric. But Honda is apparently not offering the hybrid model in the U.S. Honda may be working on a new compact sedan and crossover based on the Fit, for the U.S. and it could be sold in North-America early in 2014 with a similar hybrid system. The Japanese model features a unique hybrid system called Sport Hybrid Intelligent Dual Clutch Drive (i-DCD). The new system is Honda's new-generation powertrain technology and is a one-motor hybrid system. It realizes the EV drive by disengaging the engine and motor. It uses their newly developed inline 4-cylinder 1.5-liter Atkinson cycle engine and it’s coupled with a seven-speed DCT system with a built-in high-output motor. It also utilizes an electric servo brake system that increases electrical regenerative efficiency and a fully-electric compressor that reduces engine load. Honda says the newly developed hybrid system improves the vehicle's fuel economy by more than 35% compared to a current IMA hybrid system. The Sport Hybrid i-DCD automatically changes to three driving modes depending on the driving situation. They are EV Drive Mode for motor-only driving, the Hybrid Drive Mode for both engine and motor driving and the Engine Drive Mode for engine only driving. The all-new 2014 Honda Fit Hybrid will launch in Japan in early September. Hopefully the Japanese automaker will either bring the hybrid Fit to the U.S., or develop a new compact sedan and crossover based on the Sport Hybrid i-DCD hybrid system. Stay tuned.